Count yourself lucky that this wolf doesn’t hunt in a pack as you might never get the chance to steal some of her gold. Set deep in the desert at dusk, battle it out with this cunning canine, as well as some of her friends, to land one of the 25 winning payline combinations and get that gold you are looking for. Pragmatic Play has packed this game full of exciting features and bonus symbols so keep an eye on the reels and the prize and try to land that massive jackpot. With a 5x3 reel formation, this animal-themed slot is another winner from the innovative developers at Pragmatic Play. You will be struck by the games simplistic nature and beautiful graphics from the bold rock formations behind the reels to the lush green desert plants and the magical pink and purple hues of the twilight sky. The symbols are all carefully crafted and have a beautiful glow; you will see a horse, a buffalo, an eagle and a wildcat as well as the wolf herself. The Wolf is the Wild symbol in the game which is highly appropriate and will substitute for all of the other symbols on the reels with the exception of the scatter symbol which is represented by the rock formation. You will also see some lower value symbols popping up in the reels such as the standard playing card values A, K, Q and J. All of the multipliers and payline combination information is accessible in the paytable at the bottom of the screen so you can check exactly how much you can expect to make when you strike it lucky. The game also features a great soundtrack that really suits the desert and animal themes well but if you prefer to play without it then you can turn it off in the sounds menu. 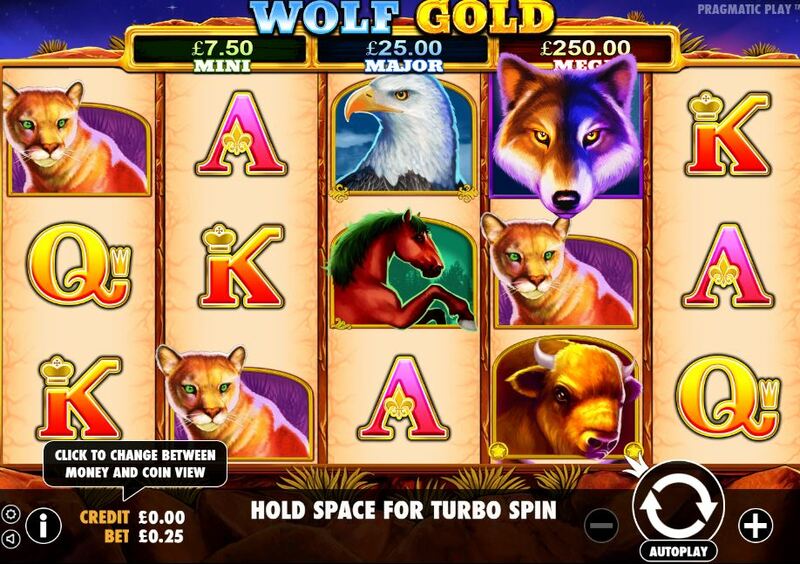 Betting starts in Wolf Gold at a very reasonable £0.25 per spin meaning that this game is great or those who are new to the world of online slots and want to start off slowly. High-rollers are also well catered for with a maximum bet of £125 and a special turbo spin boost that makes for some quick and thrilling gameplay. Betting is controlled by the + and – buttons and you can clearly see your betting amount and your credit level at the bottom of the screen. Once you have decided on an amount then simply hit the black spin button and get those reels turning. Boasting two bonus features that make Wolf Gold even more exciting; Free Spins and Money Re-spin will boost your bankroll and your mood! The free spins round is activated by getting three of the scatter symbols anywhere on the first, third and fifth reels. Following this, you will automatically get 5 free spins and see the reels transform to incorporate larger symbols that will lead to more free spins and scatters. If you see the moon symbol appear six times on the reels then all of the other symbols will be removed and you will get the chance to spin again to try and land a higher value winning combination.